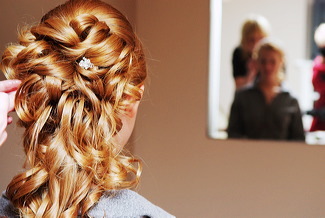 A beautiful hair style is the treasure of every lady's especially on the day of your wedding. It is our business to make sure that your "best-side" will be focused on, so that your natural beauty will flourish.. With the correct hair-style which accentuate the outline of your face, a hair color which brings out your skin tone, hair preparation whether is hot rollers or curled, the best styling products to easily maintain this standard and veil placement or any accessories to complete your bridal style. We want to give you, as a valued client, an inside and realistic look on beauty and try to give you a greater confidence by searching the correct style and creation which fits your wedding style. During consultation we will take our time choose the right hair style and color. We will take the necessary time to answer these all questions and offer helpful suggestions. This is the kind of service, we stand for. (hair lengths and thickness price varies starts at chin::add $20. per length , shoulder, shoulder, shoulder bone, mid back. Now you can have flattering natural hair styles for your wonderful wedding. 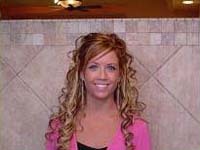 Please call and make an appointment for a consultation to discuss the correct hair extension application just for you. Hair Extensive options must be discussed at consultation to ensure texture, length, color. Hair extension options require more time and cannot be guaranteed to be installed the day of wedding* We provide pure Remy hair. It must be ordered a week in advance. Hair extension order discounts available. Please call and make an appointment for a free consultation to discuss the correct hair extension application just for you.